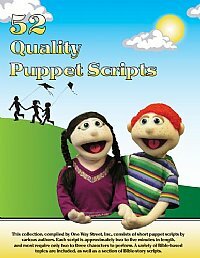 52Â Quality Puppet Script collection, consists of short puppet scripts by various authors. Each script is approximately two to five minutes in length, and most require only two or three characters to perform. A variety of Bible-based topics are included, as well as a section of Bible-story scripts. How to pray, Honesty, Tithing, Stealing, Lying, Bible Memory, The Great Commission, Armor of God, Anti-Smoking, Bible is Guide, Peer Pressure, Fishers of Men, Promises of God, God's Love Letter, Salvation, Adam and Eve, Feeding the 5000, Missing Lost Sheep, Noah, and Elijah.